Rynys Farm campsite occupies a peaceful and scenic location in the Snowdonia National Park, North Wales, about 2 miles from the village of Betws-y-Coed. This is a friendly camping site that prides itself on its spotlessly clean facilities. The campsite offers marvellous views from your caravan or tent down the Machno Valley or towards Moel Siabod. There is also now a Shepherd's Hut, and Yurt available for those looking for the comfort of glamping and we now have WiFi available on site. This peaceful campsite caters for tents, touring caravans, and motorhomes. The campsite is 2 miles from Betws-y-Coed and has stunning mountain views. The Shepherd's Hut sleeps 2 and is ideal for a luxurious camping / glamping break in Snowdonia. There is electric light, and a woodburning stove for those colder evenings - the hut is available all year. Our yurt was new for 2013. This cosy yurt is ideal for a family as it sleeps 2 adults and 2 children. There is a log burner and 2 ring gas stove and oven - the yurt is available from Easter to the end of October. There is a comfortable static holiday caravan available on the campsite.
" This was a gem of a site, bushes, trees, rock outcrops, a stream, very interesting contours and absolutely beautiful views of the surrounding countryside and the Snowdonia contours in the background. " 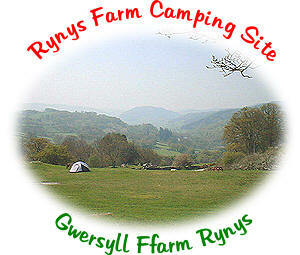 See what people say about Rynys on ukcampsite.co.uk. No admittance to newcomers between 10pm and 10am. No camp fires, only barbeques extinguished by 11pm. Just 2 miles from the hustle and bustle of Betws-y-Coed, this is an ideal base for Snowdonia and North Wales. Find out more about what you can do in Snowdonia and North Wales whilst staying at the campsite, and see our find us page for a Googlemap and route planner.